The UPA government is likely to face a stormy budget session beginning tomorrow with the opposition led by a rejuvenated BJP, riding high on its Gujarat and Himachal Pradesh victories, ready to take on the Manmohan Singh Government on various issues. Parliamentary affairs minister P.R Dasmunsi today detailed the UPA government’s priorities for the budget session, including the introduction of nearly 55 Bills apart from the introduction of the general and rail budget. 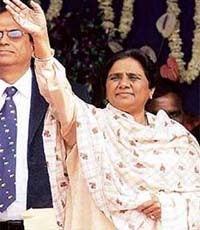 Addressing her first rally after the recent meeting with Congress president Sonia Gandhi, Uttar Pradesh Chief Minister and BSP supremo Mayawati today skirted the issues of withdrawal of support to the Centre and demanded reservation for Dalits among Muslims and Christians. West Bengal Chief Minister Buddhadeb Bhattacharjee today appealed to the Gorkha Janamukti Morcha to end its eight-day-old hunger strike and sit for a dialogue with him as early as possible. The Supreme Court has defined afresh the guidelines for the high courts to use their special powers under section 482 of the CrPC to intervene in the pending criminal cases before trial courts, saying the power has to be used “sparingly and with circumspection”. The BJP today said the Centre should lodge a protest against Beijing over China’s stand on Prime Minister Manmohan Singh’s visit to Arunachal Pradesh last month. “It (Chinese remark) was very unfortunate. The government should strongly protest it,” BJP president Rajnath Singh said, claiming that during the tenure of the NDA government, India occupied an important position in the global arena. Though India and China have differing perception on the boundary line in Arunachal Pradesh, the two armies will go ahead with their second joint military exercise. "For the first time, we had an exercise with China in their territory. The next joint exercise will be held in India this year. Special prayers, mass weddings, blood donations, distribution of food and aid to the poor marked the 60th birthday celebrations of AIADMK chief Jayalalithaa across the state today. At least 12 passengers were killed, two others were seriously injured and one went untraced when a night-bus bound for Guwahati plunged into a stream after crashing on a bridge along the National Highway-37 at Patgaon, near Sonapur about 40 km east of Guwahati city, at around 4.30 am today. The police informed that the bus was travelling from Silapathar in Lakhimpur district in East Assam to Guwahati with at least 15 persons on board. Twenty-five Indians on board the Panamanian cargo vessel ‘MV Rezzak’ were feared dead, a top official in the Directorate General of Shipping here said today, six days after the ship went missing in the Black Sea. The CBSE's announcement about the introduction of a new pattern of questions just a month ahead of the Class X and XII examinations this year has left students and parents clueless about what to expect. Kareena Kapoor won the best actress award for ‘Jab We Met’ and Shah Rukh Khan the best actor award for his role as coach Kabir Khan in ‘Chak De India’ at the 53rd Filmfare Awards here last night. On the face of the Supreme Court ordering release of arms dealer Suresh Nanda’s passport, the CBI has written to the government to revoke it. The CBI also plans to approach the apex court for review of its order. Rupees 24 lakh was “found” from a hotel room booked by a Congress leader in Shillong today by observers of the Election Commission, which said the money “appeared legal”. Two Hindi speaking persons were shot dead by the Karbi Longri National Liberation Front militants this morning in Assam’s Karbi Anglong district, the police sources said. The two victims, from Nagaon district, had come to Rongpur village for looking at a bride when the militants shot them dead, sources said. Nine days after Maoists attacked armouries and police stations in Nayagarh district, the Orissa Government today expressed its readiness to hold talks with the ultras if they gave up arms and shunned violence. Voter turnout for the Pauri Garhwal parliamentary byelection today remained low. No untoward incident was reported from anywhere in the constituency. Officially, the overall turnout in the constituency that included Pauri, Dehra Dun, Chamoli and Rudarprayag districts remained 39 per cent till 4 pm. Filmmaker Aditya Chopra, whose films have featured eternal romance, is all set to separate from his wife Payal Khanna. The couple has filed for divorce by mutual consent in a family court here, citing irreconcilable differences. Eighteen persons were detained today in connection with the thrashing of a youth who fell prey to vigilante justice after he was arrested for fatally stabbing his friend. “We have taken 18 people into custody for interrogation in connection with yesterday’s mob violence,” a senior police official told PTI here. Youth cynical as campaigning picks up in Meghalaya. Bird flu scare hits poultry biz in Tripura. Woman drives an auto in Assam. Afghani singer aims to preserve classical music. Young Indian designer attempts a world record. A look at the unusual ‘Cricket and Bollywood’ bond. One Two Three’s music is ingrained in the story. The problem for the government is compounded with its Left allies angry over Centre’s “failure” to control the prices, particularly the recent hike in petrol prices and of course with their continued differences on the Indo-US nuclear deal, giving the opposition another opportunity to “taunt” the UPA. The Budget Session will start with President Pratibha Patil’s address to the joint sitting of Parliament and the opposition has declared that it will allow the head of the State to read her speech and presentation of the rail and general budget without any obstacle. With a series of Assembly elections lined up during the current financial year and the general elections due next year, the coming budget session would be a litmus test for the Manmohan Singh government as it enters its fourth year in office. Considering the high political stakes for every political player, the Congress-led UPA, the BJP-led NDA and the Left, each are expected to score political points against other. The government is expected to go all out to cheer the common man with an easy budget, to be presented by finance minister P. Chidambaram on February 29. Railway minister Lalu Prasad, who had been hogging the headlines for turning the railways into a profit making organisation during the past three years, is also expected to give a “flavour” to the UPA’s “political endeavour” in his rail budget on February 26 in a bid to thwart any attack from the opposition. The BJP is gearing up to put the UPA on the mat on issues of price rise, farm policy, farmers’ suicides, internal security and an increase in terror attacks. The BJP, which all along has been targeting the UPA Government for its “soft policy” on terrorism, is planning to go all out against the government on internal security and rising terror incidents. Sensing this, the UPA chariperson and Congress president Sonia Gandhi had recently sharpened her rebuttal to the BJP’s charges by referring to the Kandhar plane hiijack incident and release of three dreaded terrorists, including Masood Azhar in exchange, giving an indication that the ruling alliance would be coming prepared. The Lok Sabha Speaker, who will be facing tough time in the House held a customary luncheon meeting with the political parties and made it clear that discussions would be allowed, subject to rules and time. He told reporters after the meeting that there should be no difficulty in having discussions on any issue raised in the House but the rules will have to be followed. Chatterjee said after the financial business was completed during the first half of the session, discussions on these subjects would be taken up. The business advisory committee would identify the issues to be raised during the session, he said. The meeting was attended by Prime Minister Manmohan Singh, the Leader of Opposition L.K. Advani, parliamentary affairs minister P.R. Dasmunsi, Ajit Singh (RLD), Ram Chandra Paswan (LJP) , S.S. Dhindsa (SAD) and Raghu Nath Jha (RJD). While the Left is to raise the issue of price rise and agrarian issues, they have already submitted a memorandum to the government demanding a drastic increase in corporate and transaction taxes and a new deal for farmers, the SP is likely to raise the issue of Raj Thackeray’s attack on North Indians. Other issues confronting the government are Indo-US nuclear deal and the kidney racket, unearthed recently. Dasmunsi said the session will provide 35 sittings, 18 during the first part before recess and 17 during the second phase before it comes to close with the passage of the general and rail budget. Addressing mediapersons on the eve of the crucial budget session for UPA government, which will be facing a series of assembly elections this year and general election in May 2009, Dasmunsi said the session will conclude on May 9. During the period the two Houses will adjourn for the recess for 25 days on March 20 and reassemble on April 15. Besides, debating Motion of Thanks to President Pratibha Patil’s speech to the joint session tomorrow, both the Houses will discuss rail and general budgets, the budget for Karnataka, which is under Central rule. He said the efforts of the government would be to provide sufficient time for the transaction of essential legislative and non-legislative business during the session. The Bills listed by the minister, include the Delimitation Amendment Ordinance, Railways Amendment Ordinance, Forward Contracts Regulation Amendment Ordinance, Sugar Development Fund Ordinance, Prasar Bharati Amendment Ordinance, Food Safety and Standards Ordinance. Also listed are -National Highways Authority Bill, Foreign Trade Amendment Bill, Prevention of Money Laundering Bill, Mines and Minerals Amendment Bill, Right to Education Bill, Seeds Bill, Information and Technology Bill etc. Launching BSP’s campaign in Delhi ahead of Assembly elections scheduled later this year, Mayawati was not caustic in her attack on the Congress and instead criticised both BJP and Congress for their "misrule" since Independence and "pro-rich policies". Despite the rally being held on the eve of the Budget session of Parliament, Mayawati did not refer to her earlier threat to take a decision on the issue of withdrawal of support to the Congress-led coalition at the Centre after March 10. Even on the Taj corridor issue and the disproportionate assets case, she did not name the Congress directly but charged the BJP with "joining hands with other parties to tarnish her image" by raking up such issues. The Uttar Pradesh Chief Minister also cautioned against a "ploy" to project the BSP as an anti-upper caste party and said the truth was just the opposite. "Would I have allowed such a high post to Satish Chandra Mishra, a Brahmin, in my party and government if I was anti-upper caste," she said. She favoured reservation for Dalit converts into Islam and Christianity. "I have written a letter to the Prime Minister demanding reservation for Dalits who have converted into Christian and Muslim religion," she said. She also batted for reservation for poor upper class and Gujjars and asked her cadre to begin preparations for bringing the BSP to power in Delhi. Mayawati justified her practice of receiving gifts from her party workers saying, "It will lead the party in making pro-poor policies when it comes to power." "While parties like the BJP and Congress are run by money from industrialists, our party runs on your hard-earned money," she said. West Bengal Chief Minister Buddhadeb Bhattacharjee today appealed to the Gorkha Janamukti Morcha (GJM) to end its eight-day-old hunger strike and sit for a dialogue with him as early as possible. “The prevailing situation of Darjeeling is serious. I am appealing to all parties which are agitating and are holding hunger strike to call off their fast,” he said in a statement. It is the first attempt by Bhattacharjee since the trouble over GNLF chief Subash Ghising’s continuation as the caretaker administrator of Darjeeling Gorkha Hill Council erupted earlier this month. Three hill subdivisions of Darjeeling, Kalimgpong and Kurseong are in the grip of an indefinite bandh by the GJM for the fifth day today demanding Ghising’s resignation and a separate Gorkhaland state. Governor Gopal Krishna Gandhi has also appealed to the striking GJM leaders to start negotiation with the state government. Ghising will be meeting the Governor at Raj Bhavan tomorrow for apprising him about the problems in the hills following the delay in the granting of sixth schedule by the Centre. Meanwhile, the Chief Minister today reached New Delhi for attending the CPM politburo and the central committee meetings beginning tomorrow. During his stay, he will also meet the Prime Minister and the Home Minister to discuss the Darjeeling problem. The Chief Minister already held talks with Ghising yesterday and sought his suggestions for solving the problem. Meanwhile, the condition of 10 GJM volunteers participating in the fast-unto-death from February 17 is said to be serious with three of them developing serious kidney and heart ailment. The volunteers have refused any treatment offered by the government and are continuing their fast to press their demand for immediate ouster of Ghising as the caretaker administrator of Darjeeling Gorkha Hill Council and separate Gorkhaland state, press and publicity secretary Benoy Tamang said. The two who developed kidney ailment are fasting at Kurseong, while the other with heart ailment is on fast at Darjeeling. Asked about the steps taken by the GJM to save the lives of its members participating in the fast, Tamang said each of them had signed bonds. “However, if any of the protestors die the situation in the hills might go out of control and the state government and Ghising would be held responsible for it,” he said. The seven-point guidelines were reframed by a three-judge Bench of Chief Justice K.G Balakrsihnan and Justices R .V Raveendran and J. M. Panchal in the much debated NASSCOM chief Som Mittal’s case after a controversy had risen in a judgement with two judges of an earlier Bench having differences on use of the section 482 powers. The CJI, writing the verdict for the larger Bench to correct the differences between Justice H.K Sema and Justice Markandey Katju, had said though no clear cut formula could be laid down but the proceedings before the trial court could be quashed only on facts of each case. “Quashing of a complaint or criminal proceedings under Section 482 depends on the facts and circumstances of each case,” the apex court said listing nearly a dozen of cases for high courts to follow as examples. The basic difference between Justice Sema and Justice Katju was that the former said the power under Section 482 be used by the high courts in “rarest of the rare cases” but the latter said the term “rarest of rare” was only used in murder cases, and therefore, could not be applied in other offences while the high courts could use the power in the other criminal cases also. But the larger Bench, headed by the CJI said the inference drawn by Justice Katju on the findings of Justice Sema to the term “rarest of rare” was not correct by linking it to only murder cases, where death sentence is awarded. “What Sema, observed that the power under Section 482 was to be used sparingly, with circumspection and in rarest of rare cases, he did not lay down any new preposition of the law, but was merely reiterating what was stated by this court in several cases (earlier),” the CJI’s judgement said. “It may not therefore be correct to say that the words rarest of rare cases are appropriate only when considering death sentence for offence under Section 302 (murder) of the IPC or those words are inappropriate when referring to ambit of the power to be exercised under Section 482 CrPC,” the CJI held. The BJP today said the Centre should lodge a protest against Beijing over China’s stand on Prime Minister Manmohan Singh’s visit to Arunachal Pradesh last month. “It (Chinese remark) was very unfortunate. The government should strongly protest it,” BJP president Rajnath Singh said, claiming that during the tenure of the NDA government, India occupied an important position in the global arena. “But now under the UPA regime, some countries, including China, are not according importance to India,” said Singh, who came here in connection with BJP election campaign in Nagaland. He pointed out that it was unfortunate that China reacted to the Prime Minister’s visit only a fortnight after Manmohan Singh’s high-level visit to Beijing. Referring to the growing threat of terrorism and mushrooming of sleeper cells across the country, the BJP chief accused the Congress-led UPA government of being soft on this problem as well on infiltration issue. Though India and China have differing perception on the boundary line in Arunachal Pradesh, the two armies will go ahead with their second joint military exercise. "For the first time, we had an exercise with China in their territory. The next joint exercise will be held in India this year. You can wait for it," defence minister A.K. Antony told mediapersons here today. Asked about the Chinese incursions in Arunachal Pradesh, the defence minister said, "There exists an established channel to sort out such matters." Antony said the India-China border was not demarcated yet. "It is not settled yet. There is always some scope for confusion," he said. Antony was speaking after a visit to Laungwala, the historic site where about 100 Indian soldiers thwarted an attack by Pakistani troops during the 1971 Indo-Pak war. New Delhi and Beijing carried out their first-ever joint military exercise in China's southwestern province of Yunnan in December last year which was helpful in building mutual trust and promoting cooperation between the armies of the two countries. The purpose of the joint military exercise with China was aimed at taking the ties between the armed forces of two countries to a new high. Antony also expressed hope that the Pay Commission will give the armed forces the best. Joining the celebrations in Chennai, Jayalalithaa, whose birthdays had been a quiet affair in the past few years, solemnised the wedding of 60 couples on the occasion. Amid cheers from party cadres, who had gathered in large numbers, Jayalalithaa blessed the 'mangalsutras' and presented them to the bridegrooms. All brides were dressed in green, believed to be Jayalalithaa's favourite colour. As a wedding gift, she presented 60 household articles, including silver lamps, coats, clocks, wrist watches and LPG stoves, to each couple. Turning nostalgic on the occasion, she said, "My father died at the age of 42, my mother at 47 and my brother at 49. But, I've crossed 59 and entered 60. It is all due to the blessings of my mother Sandhya and political mentor M.G. Ramachandran and the love bestowed by you all," the former Chief Minister said amid loud cheers from the cadres. At least 12 passengers were killed, two others were seriously injured and one went untraced when a night-bus bound for Guwahati plunged into a stream after crashing on a bridge along the National Highway-37 at Patgaon, near Sonapur about 40 km east of Guwahati city, at around 4.30 am today. The police informed that the bus was travelling from Silapathar in Lakhimpur district in East Assam to Guwahati with at least 15 persons on board. The sound of the bus falling into the stream woke up villagers in the area and a group of youth from the village managed to retrieve two injured persons. Later, personnel from the Rapid Action Team of the border security sorce based in Guwahati recovered 12 bodies from the bus that got mangled in the impact of the fall to the stream from a height of about 25 feet. The roof of the bus (As 01T 4776) caved in after the fall. The caretaker of the bus, Amol Das and one other passenger, who were rescued by in grievously injured condition, were immediately rushed to Guwahati Medical College Hospital. Assam Chief Minister Tarun Gogoi condoled the death of 12 persons and directed the district administration to probe the incident. He also announced an ex-gratia payment of Rs one lakh to the next of kin of each of the deceased. 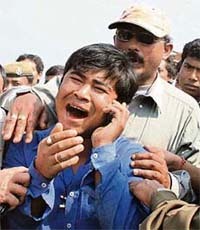 The Chief Minister also directed the Kamrup district administration to institute a magisterial inquiry into the mishap. The senior police and district administration officials, led by Kamrup deputy commissioner Protik Hazela, were overseeing the rescue operation at the incident site. The district administration requisitioned the service of the BSF Rapid Action Team that was formed for purpose of hazard relief and rescue operation to help retrieved bodies inside the bus. The badly damaged bus was later pulled out of the stream. The ship, which lost contact on February 18, is believed to have sank off the coast of Turkey, but a search operation was still on. A life raft had been seen floating in the sea but there were no survivors inside it or near its vicinity. CBSE chairman Ashok Ganguly had recently announced that some new kind of questions would be introduced in the exams this year that would focus more on understanding and analysis rather than the memorising ability of the students. A student of Manasthali Public school in the capital, who is appearing in the Class X exams, said she is at sea on what the new type of questions would be like. "We have 29 chapters in social studies. There is a need for some memorising," she said, adding it is not like mathematics where it is about learning the formulae and applying them. "Twenty per cent of the questions will be based on 'high-order thinking skills'. But what do they mean by 'high-order thinking skills'”? she asked. Students have been calling up the helpline numbers and asking about what the new questions would be like. "I was told by the counsellor that I have to be thorough with the textbook. But this announcement about the new type of questions at the last minute has left me scared. It has also taken a toll on my health," said Mani, another student with a reputed school in the capital. Board exams are like a family ritual, where everyone at home is involved. "It is the parents who have been of late calling me up since they heard about the new type of questions. The whole family is involved when the child is set for some exam like the boards. Parents ask me as to what sort of questions can be expected," said Dr Sunita Roy, a student's counsellor in Delhi. "I remember there was this child whose mother started crying. She was inconsolable," Roy said. Another counsellor, Dr Reena, said, "I told many parents that this decision was nothing new. It is expected that children be thorough with their textbook. Some parents have talked to me for hours together." Over 13.13 lakh students are appearing in the exams starting from March 1. While parents and students have approached counsellors and helplines for suggestions on the new question format, very few have turned to the school for help. The CBSE's decision has been welcomed by school principals. "This is something good. It is nothing new and students need not panic. Learning by heart does not help in any stage of life. Understanding helps and it has helped in the past," said Dr Shyama Chona, principal, Delhi Public School, R K Puram. Aamir Khan won the best director award for ‘Taare Zameen Par’, the film was also declared the best film, while Amol Gupte won the trophy for best story in the same film. Bollywood star Rishi Kapoor was conferred with the lifetime achievement award while music director Monty Sharma bagged with R.D. Burman award for his track in Sanjay Leela Bhansali film ‘Saawariya’. The best screenplay award was given to Anurag Basu for the film ‘Life in a metro’. Imtiaz Ali won award for the best dialogue in the film ‘Jab We Met’, while ‘Chak De’ won nation’s for best cinematography. The other winners of the Filmfare award include newcomer Deepika Padukone, who won the best fresh face award for her film ‘Om Shanti Om’, while Ranbir Kapoor was given the best new comer award for ‘Saawariya’. Irfan Khan and Konkona Sen Sharma won the best supporting actor and best supporting actress, respectively, for the film ‘Life in a metro’. Child actor Darsheel Safary won the best actor (critics) award for his brilliant portrayal of Ishaan Awasthi a dyslexic child in ‘Taare Zameen Par’, while Tabu won the best actress (critics) award for the film ‘Cheeni Kum’, ‘Chak De India’ won the best film critics award. Musical maestro A.R. Rahman won the award for best music in Mani Rathnam’s ‘Guru’, Prasoon Joshi won it for best lyrics in the film ‘Taare Zameen Par’. Among the playback singers Shreya Ghoshal won the best female playback singer award, while Shaan won the best male playback singer award for his song ‘Jab Se Tere Naina’ in ‘Saawariya’. Nanda, a UK-based NRI, is facing CBI investigation for his alleged role in some defence deals, particularly the Barak missiles purchase from Israel and the armoured recovery vehicles agreement. The agency has sent a letter to the Ministry of External Affairs for revoking the passport of Nanda, a son of former Naval Chief S M Nanda by applying the provision of Section 10 of the Passport Act, which only empowers the Passport Authority to take such action, sources said. The CBI is under pressure from the Supreme Court to submit its status report on the investigation in the defence deals during the NDA regime after the CAG had raised doubts on various purchases, particularly those entered into during Kargil war. Only last week the Supreme Court has given four weeks’ time to the CBI to submit its status report. The agency is probing the allegations that Nanda was involved in the Rs 400 crore kickback in the deal. The CBI soon after the Supreme Court’s order asking it to release his passport, had got it temporarily suspended for four weeks on January 30, using its powers under the Act. However, Nanda had denied any wrongdoing in any of the defence deals and claimed that the money received from overseas was through legitimate banking channels. Meanwhile, the CBI has questioned Nanda at least thrice since the agency was asked to release his passport by the Supreme Court, sources said, adding that the apex court would soon be approached in a review petition against its order. The EC observers and the police conducted the ‘raid’ after specific complaints and found the money, the police sources said. While the police and the observers declined to disclose more details, state chief electoral officer P. Naik said, “Prima facie the money appeared legal.” “The Congress says it was party fund for the candidates and a part of it was to be used for the rallies, including those addressed by Sonia Gandhi. We’ll have to wait for the inquiry to come to any conclusion,” Naik said. Two Hindi speaking persons were shot dead by the Karbi Longri National Liberation Front (KLNLF) militants this morning in Assam’s Karbi Anglong district, the police sources said. The two victims, from Nagaon district, had come to Rongpur village for looking at a bride when the militants shot them dead, sources said. "My government is always prepared for dialogue with the Naxalites, but first they should give up arms and the path of violence," Chief Minister Naveen Patnaik told mediapersons after reviewing the ongoing combing operation against the Maoists at a high-level meeting here. Combing and search operations have so far led to the recovery of 80 per cent of the arms and 75 per cent of the ammunition looted by Maoists from the armouries in Nayagarh, he said. Voter turnout for the Pauri Garhwal parliamentary byelection today remained low. No untoward incident was reported from anywhere in the constituency. Officially, the overall turnout in the constituency that included Pauri, Dehra Dun, Chamoli and Rudarprayag districts remained 39 per cent till 4 pm. The Kedarnath Assembly segment in Rudarprayag district, however, registered the maximum turnout of 48.6 per cent as compared to 33 per cent in Dehra Dun. The overall turnout in this constituency was around 47 per cent in the 2004 Lok Sabha elections. Filmmaker Aditya Chopra, whose films have featured eternal romance, is all set to separate from his wife Payal Khanna. The couple has filed for divorce by mutual consent in a family court here, citing irreconcilable differences. Chopra, who has made films like hugely hit “Dilwale Dulhaniya Le Jayenge” and “Mohabbatein”, somehow has been unable to maintain the “romance” in his real life. The application, which was heard by Principal Judge Anand Nirgude about two months ago, has been kept pending for the mandatory six-month period granted to the couple to reconsider their decision. The mandatory period for Aditya, son of renowned filmmaker Yash Chopra, and Payal, will get over in May. “The application has to be heard again after six months of filing the application for divorce by mutual consent. It will come up after this period is over but not later than 18 months after the filing of the same,” said a highly placed source in the family court. Eighteen persons were detained today in connection with the thrashing of a youth who fell prey to vigilante justice after he was arrested for fatally stabbing his friend. “We have taken 18 people into custody for interrogation in connection with yesterday’s mob violence,” a senior police official told PTI here. College student Ravi Kumar, who stabbed his roommate Om Prakash to death for using a mobile phone, was yesterday forcibly snatched by a violent crowd from policemen who were escorting him. The youth, who was in handcuffs, was dragged outside the hospital, kicked and mercilessly hit with bricks.